Location: Passy, in the Paris departement of France (Ile-de-France Region). Notes: Château de Boulainvilliers is an ancient castle located in the municipality of Passy, now in the 16th district of Paris. Passy castle was built in 1381. 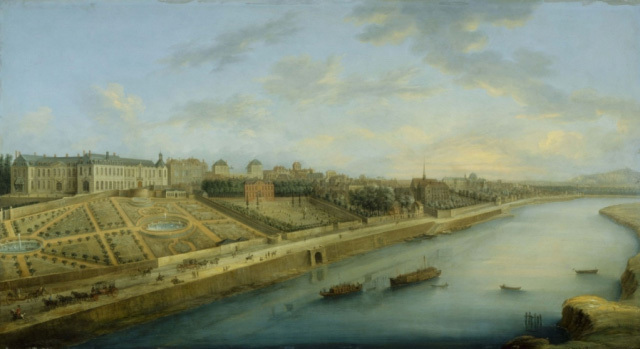 He bought 13 April 1722 by the banker Samuel Bernard Manon Dancourt to his mistress, the couple does restore the architect Jules Robert de Cotte. Dancourt had inherited it through his marriage in 1702 with the marine controller, Jean-Louis-Guillaume Fontaine (1666-1714). The castle took the name of "Boulainvilliers" from December 1745 when the grand-son of Samuel Bernard to whom we owe the dimensions of the field, inherited. He was previously occupied by his father, Gabriel Bernard de Rieux, son of the banker, from 1737. His son, Gabriel Bernard-Henri Boulainvilliers (1724-1798), praised him for life Alexandre Le Riche de La Poupelinière in 1747 which was in the possession until his death in 1762. Thereafter, the Duke of Penthièvre which acquired it. The Revolution leaves intact the castle and the park Passy, ​​but in 1815, the property gardens were particularly devastated by the English. Mr. Cabal, notary, sold the domain in 1826 that was dismantled and cut into parcels. Speculators traced instead of the domain a new neighborhood called "Boulainvilliers". The industrialist and philanthropist David Singer and Louis Mors, famous car manufacturer, acquire large portions. This area was the home of Radio France until the Avenue Mozart.